Enjoy a great night's sleep anywhere you stop. 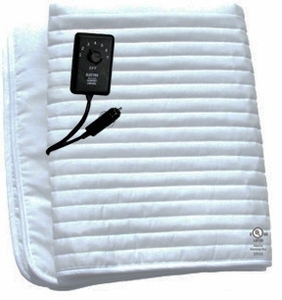 12 volt bunk warming pad goes "on the mattress" under you (heat rises). Plugs into the lighter socket. Pre-warms bunk and gets rid of dampness. Heat soothes and relaxes tired back and legs. Helps lull you to sleep. Keeps you warm all night without idling the engine. No more engine noise, vibration, or exhaust fumes. Automatic Comfort Control thermostat regulates heat based upon the setting you select (1 - 7). It adjusts the heat in the bunk for any change in cab temperature. Save fuel and engine wear by bit having to idle your engine to stay warm.